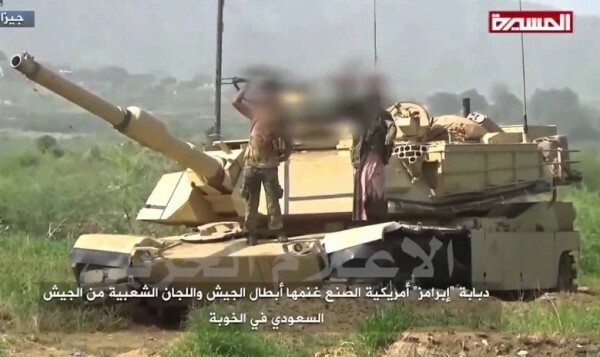 The Saudi Arabian Army has apparently lost over 20 M1A2S Abrams main battle tanks to Soviet-era anti-tank guided missiles fired by Houthi rebels backed by Iran, and the Saudi government is now buying more tanks from the United States to replace rising losses. The Saudis don't confirm battlefield losses and the estimate of 20 destroyed Abrams was revealed in August. That number is certain to have risen since Houthi rebels have posted new videos on YouTube showing more Saudi Abrams being hit by anti-tank guided missiles (ATGMs), more likely the Tosun (Tosan), an Iranian upgrade of the Soviet-era 9M113 Konkurs ATGM. Saudi Arabia leads a military coalition of 10 Arab states that has been fighting in the Yemini Civil War since March 2015 to restore to power the legitimate regime of President Abdrabbuh Mansur Hadi ousted by Shia Houthi rebels militarily supported by Iran. The Saudi-led coalition includes the United Arab Emirates, Bahrain, Kuwait, Qatar, Egypt, Jordan, Morocco, Senegal and Sudan. That little known but vicious campaign has seen Saudi military deaths exceed 430 men. The loss of 20 tanks was again brought to light by the U.S. approval of a Saudi government request to purchase 153 M1A2S tanks as part of a $1.15 billion package. The Saudi government said it wanted the tanks as "battle damage replacements" for tanks lost in combat. The M1A2S is a version of the Abrams specially modified to the specifications of the Saudi Arabian Army. It does not, however, appear to be protected by the depleted uranium (DU) armor that made U.S. Army Abrams so hard to destroy in the two wars against Iraq. Kuwait has also asked the U.S. Congress to approve the sale of a recapitalization package for 218 of its M1A2 main battle tanks. The U.S. Army claims none of its Abrams were lost to ATGMs during the Gulf War and the 2003 Iraq War. Some experts claim the U.S. has lost 14 Abrams, most of them to powerful IEDs (improvised explosive devices), one of which tore the turret off an Abrams, killing two of the four crewmen. Most Abrams' battlefield losses in both wars seem to have been inflicted by friendly fire. The tank is vulnerable to U.S.-made Hellfire ATGMs fired from combat helicopters such as the Boeing AH-64 Apache attack helicopter.